My teacher, Grandmaster Yang Meijun楊梅君 said Dayan Qigong大雁氣功 is about 1800 years old and that before Dao An there was other masters who passed his skill on. One of these was Fu An道安. I believe that Fu An was a Daoist and Dao An was a Buddhist. In the Three Kingdoms Period there was another famous person who was a Chinese Medicine doctor. His name was Hwa Tou (145 – 208 BC). His medical skills were very high and he treated General Guan Yu關羽 and also Prime Minister Cao Cao曹操. Guan Yu shot by a poisoned arrow and Hwa Tou applied medicine to his arm and cured him. 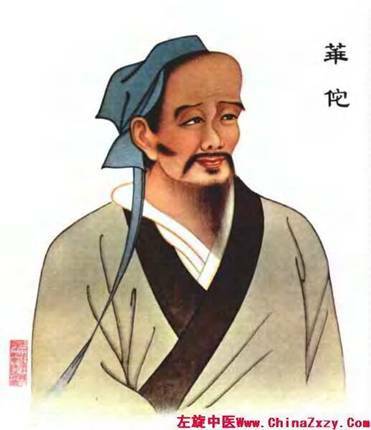 Cao Cao had a serious headache and Hwa Tou told him, “I need to open your head to remove the problem and then your pain will go away.” This shows that Hwa Tou already had knowledge of internal operations, but following the Chinese medicine way. Of course, Cao Cao did not believe him and had Hwa Tou put in prison. Hwa Tou knew he was going to die and so wrote down all of his knowledge of medicine and this also included knowledge of Qigong movements and healing. He passed his book to a prison guard, but the guard was scared of the knowledge in the book and so burnt it! However, one paged survived and this one page is what most of today’s Chinese medicine is based on! However, my Sifu also said that Hwa Tou’s Qigong knowledge also survived on that page. He created a set of movements which we know as the Five Animals Play五禽戲. These movements copy the deer, bird, monkey, tiger and bear. Dayan Qigong originally came from some of these movements.